Did Climate Change Kill 220,000 Antelope in Kazakhstan? The saga of the saiga continues, with scientists pointing to rapid temperature fluctuations as a possible culprit. In May, an ancient species of antelope — older than the mammoth — that roams the Kazakh steppe began dying off in massive numbers. The saiga antelope has been migrating across the Eurasian steppe from Mongolia to Central Asia and Russia for tens of thousands of years. “It’s like somebody waved a wand,” Dr. Richard Kock, of the Royal Veterinary College in London, said in a recent interview with PRI’s Living on Earth. When the die-off was over, an estimated 220,000 antelope were dead, out of a population of 250,000. Scientists now believe climate change may have had a hand in the unprecedented event. The saiga have a funny-looking, bulbous nose that developed to help cope with the often frigid temperatures of the region, which can reach winter lows of 49 below zero (-45 degrees Celsius). Saiga are one of the fastest hoofed animals in the world, able to run 70 miles per hour to escape predators. “So, it’s been wandering around in these large populations in the great steppe of Central Asia for tens of thousands of years and it is highly adapted to that very extreme environment,” Kock said. 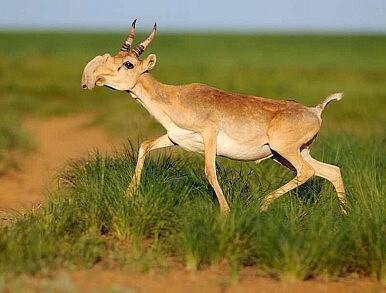 Some have speculated that weapons tests, nuclear tests on the steppe during the Soviet period, and rocket launches from the Baikonur cosmodrome are responsible for the deaths of the saiga. Kock does not mention these causes. He does note that a second factor scientists are looking at is stress of some kind. He notes that even cattle can develop “transport fever” related to a Pasteurella-type organism when subjected to stress, such as during cross-country transportation in north America. Ecosystems are extremely complex; there’s no reason there would be a simple answer to the question of why so many saiga died so suddenly. Climate change remains a political football in the West, but globally the phenomenon is taken seriously. In early December the world will gather in Paris for the United Nations Climate Change Conference (COP21), where they aim to achieve a universal agreement on climate change. The effects of climate change in Central Asia, as Benjamin Orlove of Columbia University articulated in an interview with The Diplomat earlier this year, are usually discussed with regard to water. Changes in winter snowfall impact the volume of spring melts, which impacts reservoir levels as well as how much water ultimately flows downstream. Kyrgyzstan and Tajikistan are banking on hydropower to generate energy and revenue, while Uzbekistan and Turkmenistan rely on water for their cotton fields. In addition, the oil and gas export business, which Kazakhstan, Turkmenistan, and to a lesser degree Uzbekistan, rely on for revenue, is becoming less profitable. It’s a tangle of environmental and economic concerns, long term damage, and short term profit. Kazakhstan is among the top 30 carbon dioxide emitters, globally. The state says it wants to crack down on emissions and plans to tighten environmental regulations. While islands sinking into the sea and vanishing glaciers are the global faces of climate change, the saga of the saiga may join devastating images of the Aral Sea’s destruction as a regional touchstone for the issue. Kazakh authorities recently found 1000 antelopes dead of unknown causes on the steppe. Settling the Caspian Issue and Realizing the Trans-Caspian Energy CorridorMudslides Make a Mess in Central AsiaWhat is Life in the Aralkum Like?Central Asia's Environmental SinsCan Social Media Change Governance in Central Asia?